The nights when unexpected dinners turn out to be fantastic ones are such truly satisfying nights. 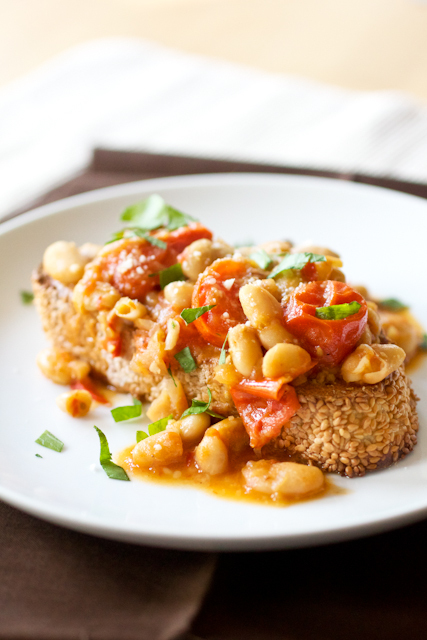 Take this white bean ragout, for example. It looked great in print on the pages of Bon Appétit but the ingredients were so basic that I couldn’t help but be a little skeptical of the results. And perhaps, it was the use of such basic ingredients the really made this meal so special. Or maybe it was the fact that it was so completely simple to make. 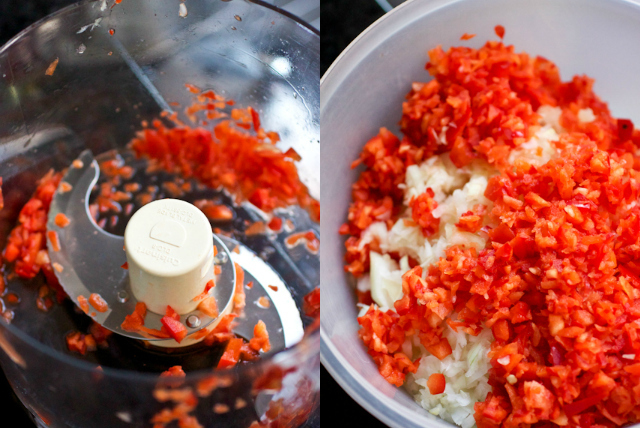 The food processor does all the hard work of chopping and then you’ll simmer down the onions and red bell peppers in what may seem like a ton of olive oil (it isn’t) for half an hour. 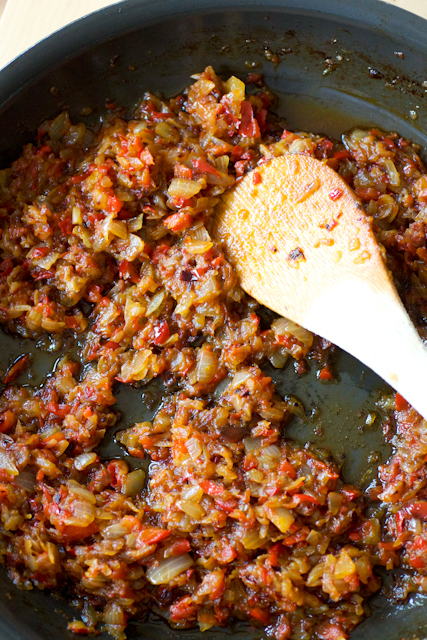 And after adding garlic and tomato paste, you’ll just have made soffritto, only one of the most versatile bases for Italian dishes you can make. The whole dish put together was homey, comforting, and hearty – all reasons why I love white beans so much. We ate the ragout served atop the Parmesan toast (I used the sesame semolina bread that we love), in our hands, like a perfectly rustic bruschetta…and then we ate the leftover ragout the next night over whole wheat spaghetti where I thinned out the mixture a little with some vegetable broth to give it more of a sauce consistency. This may be a warm and humble vegetarian meal but you won’t be sorry to make it any time of the year. I knew that making a full recipe would be too much food for just the two of us, even with the expectation of having leftovers, so I halved the ragout recipe below. However, because I definitely wanted some extra soffritto stashed in the freezer to use as the base for spaghetti sauce or minestrone soup this fall (or for this recipe again! ), I made the full amount of the soffritto and froze what remained in snack-size zipper bags. This will allow me to throw together more complicated dishes on weeknights without having to wait 30+ minutes for the soffritto to cook. To make the soffritto: In the bowl of a food processor, pulse onions until they are finely chopped but not puréed (about 2 cups should remain). Transfer the onions to a large bowl and then pulse bell pepper in the same manner – you should have about 1 cup; add the peppers to the bowl with the onions and mix well. Heat 1/2 cup of the oil in a large heavy skillet over medium heat. Carefully add the onion mixture (it may splatter) and season it with salt and pepper. Simmer, stirring often, until vegetables are completely softened, about 30-35 minutes. Add the finely grated garlic and tomato paste and cook, stirring often, until tomato paste begins to turn deep red, about 3 minutes. Measure 1/2 cup soffritto and set aside. Transfer the remaining soffritto to a bowl and set it aside to cool completely then transfer the cooled mixture to smaller containers or zipper bags to refrigerate (up to 4 days) or freeze (up to 3 months). Do not wash out the skillet. To make the toasts and ragout: Meanwhile, preheat oven to 375°F. Rub bread slices with cut sides of remaining garlic clove. Place bread on a baking sheet and sprinkle 1 tablespoon Parmesan over each slice. Toast until cheese begins to brown, about 5-7 minutes. If the cheese doesn’t start to brown by then, turn on the broiler and let the broiler brown the cheese – watch it carefully to avoid burning. Set the toasts aside, covered lightly with aluminum foil to keep warm. Heat the reserved 1/2 cup soffritto and beans in the skillet over medium-high heat. Cook, stirring often, until heated through, about 2 minutes. Stir in 3 cups broth; bring to a boil. Simmer, scraping up browned bits, until liquid is slightly thickened, about 5 minutes. Add the tomatoes and more broth if the mixture needs to be thickened; simmer until tomatoes are tender, 3-4 minutes. Stir in 2 tablespoons Parmesan. Season with salt and pepper to taste. Top each of the toasts with some bean mixture and extra broth. Garnish with remaining Parmesan and parsley. Drizzle with oil, if desired.